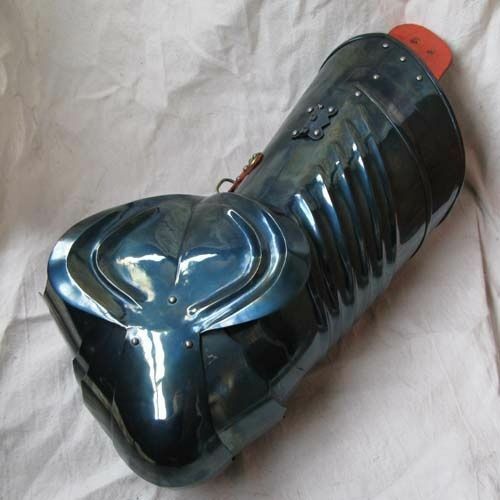 Gothic armor is a kind of plate body protection that was widespread in the XV century all over Europe. This English leg protection in Gothic style combines all typical features: sharp lines and ribs on the surface. 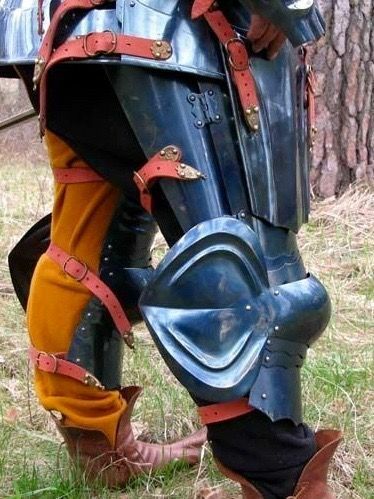 Leg armor includes of thigh defense (cuisses) and kneecaps with chased fan (kind of winged rondel that cover outer part of knee. Hinged cuisses are kept on the thigh with firm leather belts and buckles. Segmented knee part is articulated, so your moves are free and comfortable. There are also three segments under the kneecap. 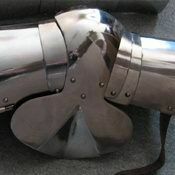 It is recommended to wear this medieval Gothic armor over the woolen chausses. 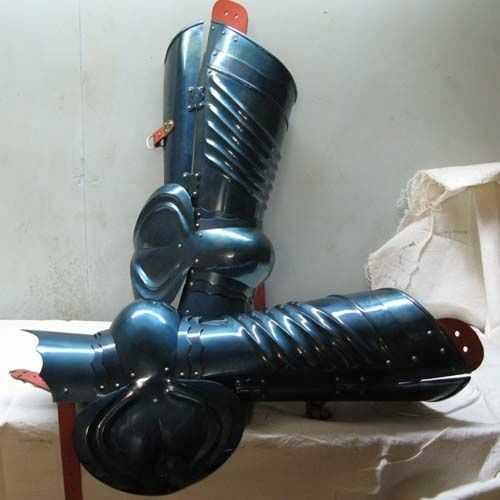 In options, you may choose another type and thickness of metal, color of belts, finish treatment and decoration for your steel leg protection of the XV century. You may also like German Gothic legs of the 2nd part of the XV century. 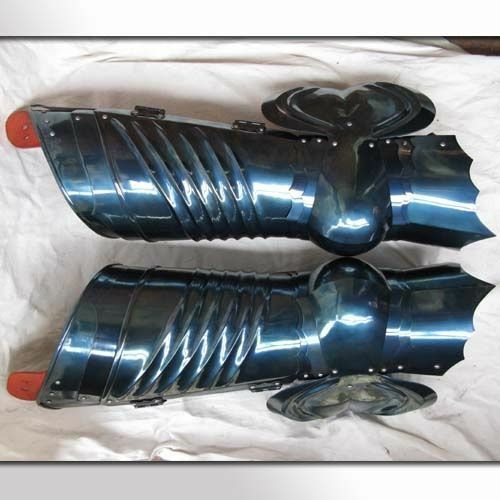 To complete your full-plate English Gothic armor, we offer you to order the same style plate arms and gauntlets. 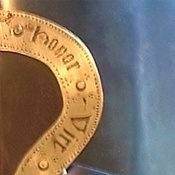 Handcrafted kneecap (poleyn) with plain rondel is quite important part of knight’s fighting outfit, which appeared in the late XIII century. Since then, medieval warriors were wearing this leg armour in combination with mail stockings, brigandine tassets or whole-hammered cuisses. Such historical sources, as paintings, engravings, effigies, etc., show us medieval knights, wearing poleyns, in combination with main leg armor. Sleeping soldier at the Holy Sepulchre. ca 1340-1345 years, Strasbourg Frauenhaus Museum, France These kneecaps are simple in design, but comfortable in wearing and reliable in protection. Caps are fastened with leather belts and buckles, which holds armor firmly on the leg. 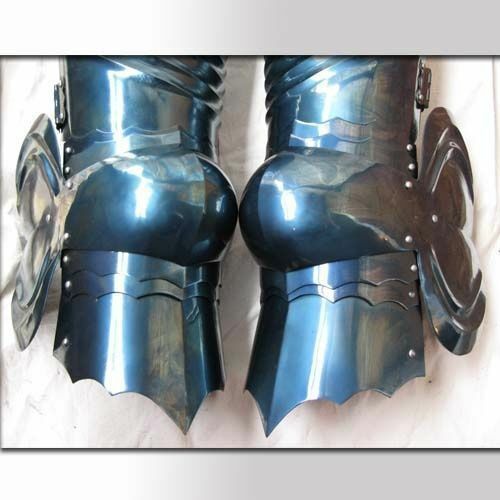 You can use these functional kneecaps for: SCA HEMA Larp Stage performances Medieval festivals Reenactment events Base price includes following options: Cold-rolled steel 1.0 mm; Satin polishing; Brown leather belts; Steel nickel-plated buckles; Steel rivets; No decoration; Painti..